A1X Terrier no 678 (ex ‘Knowle’) has had a long and varied history. Outshopped in July 1880, the engine initially worked the South London line but by the mid 1890’s was working out of Portsmouth on the Hayling Island and East Southsea branches. 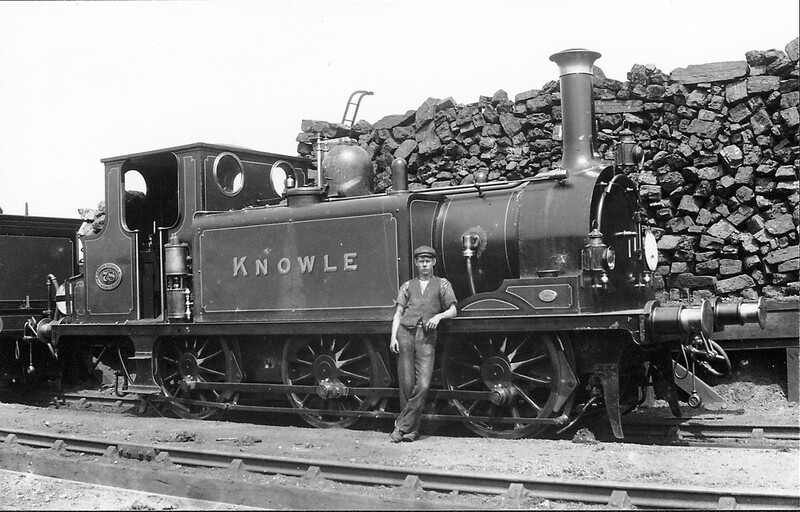 Knowle survived the cull of the class in the early 1900’s and was converted in 1907 for motor train use (push-pull working). 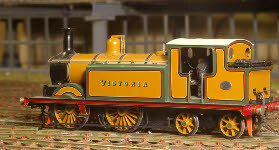 With the change of livery in 1905 the engine lost its Improved Engine Green livery, being repainted in Marsh’s umber. 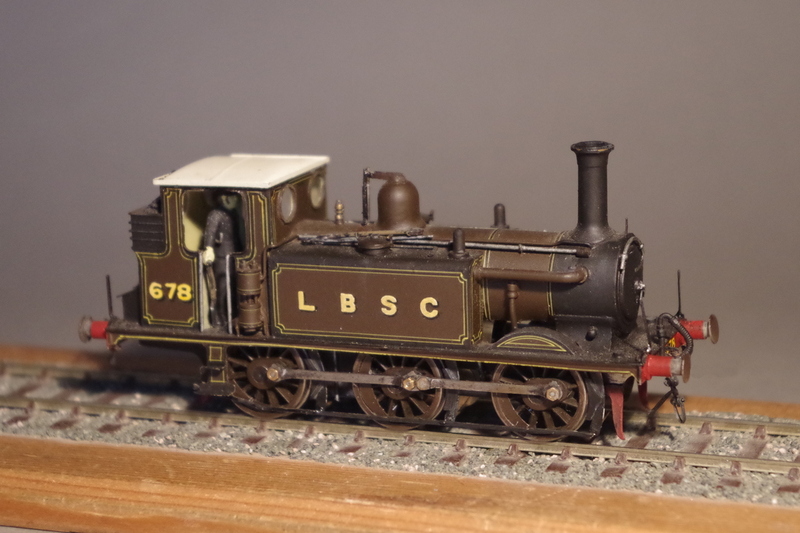 It was renumbered in 1910 to no 678 in the duplicate list, giving up the number 78 to a new member of the ‘I3’ 4-4-2 class. In 1911 it was fitted with a Marsh-design boiler, and reclassified as A1X. 678 survived the Grouping and was transferred to the Isle of Wight in 1929 as W4, and was subsequently named ‘Bembridge’. By 1936 the engine was on its last legs, and was returned to the mainland and condemned in December of that year. However, before being cut up it was reprieved, reboilered, renumbered as 2678 and sent to Fratton to haul the Hayling Island trains. 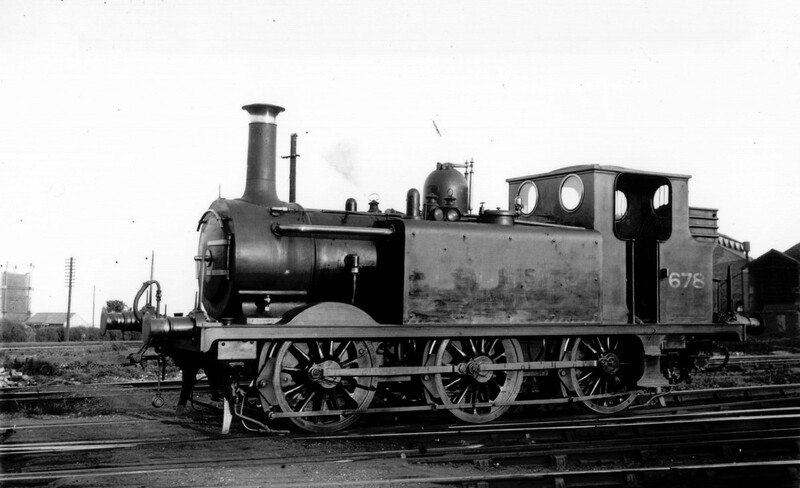 In 1938 2678 was briefly trialled at Guildford as station pilot, but was found unsuitable and returned to Fratton before being moved to the Kent and East Sussex Railway in 1942 for hop-picker’s specials, where it remained until Nationalisation. It was perhaps lucky to survive an accident in 1949 at Wittersham on the K&ESR when it derailed and ended up lying on its side in swampy ground, making it difficult to return it to the track. With the closure of the K&ESR in 1958, 2768 was again sent to Fratton, and then to Newhaven to work the West Quay. With the closure of the West Quay in 1963, no further use was found for the engine and it was sold out of service in 1964 at the venerable age of 84, to Butlins (Minehead) with a final mileage tally of 1,411, 436 miles. 32678 was purchased from Butlins in 1975, and so began a long journey of restoration with completion in 2001 in time for the opening of the K&ESR extension from Northiam to Bodiam. The loco is now owned by the Terrier Trust. 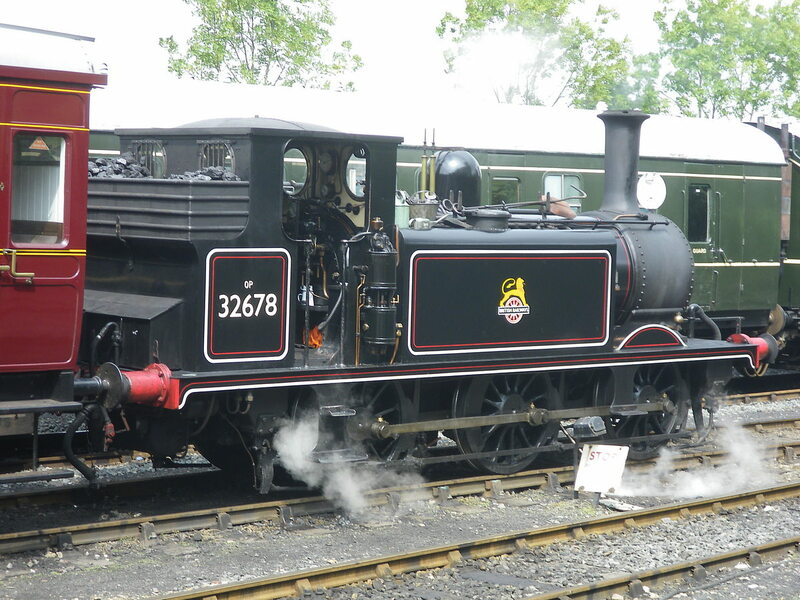 Knowle is one of a handful of Terriers to have survived, and is operational on the Kent and East Sussex Railway, seen here at Tenterden. 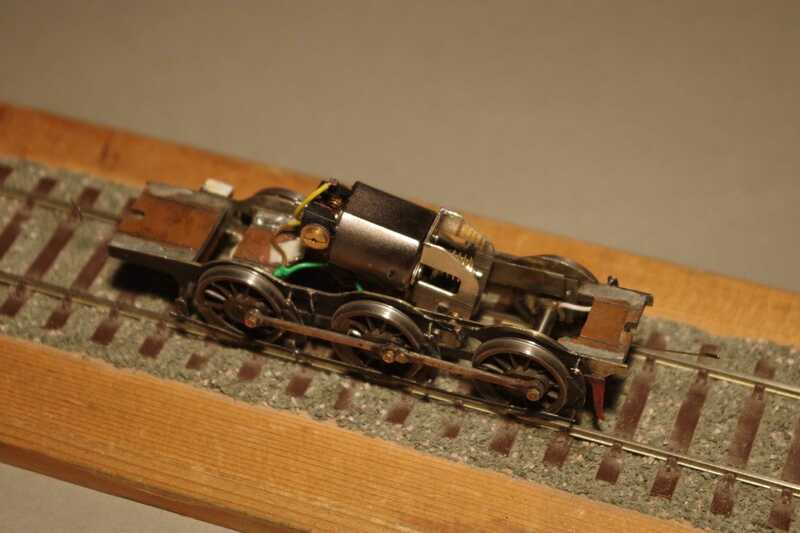 My model was one of the first locos I built. It started life as a K’s whitemetal kit. I first replaced the chassis when I decided to move from EM to P4, but then came to the conclusion that the running plate was grossly over-scale in thickness, and had to go. Various other bits went into the bin as unsuitable, and now the only part left from the original kit is the dome. The engine is now over 35 years old and is suffering a bit. It’s been painted twice, and is one of only two locos I’ve dropped. This one fell off the layout, but I didn’t notice until I kicked something across my (concrete) garage floor, and discovered it was my precious Terrier. Surprisingly little damage was done, except for a severely bent rear corner of the cab which I managed to straighten out. There were a few scratches to the paintwork, but nothing that couldn’t be repaired. Amazingly, no damage was done to the chassis. Ideally it now needs a complete repaint, but it’s quite a long way down the list. It’s seen here on Brighton Road with its scratchbuilt ‘balloon’ trailer. It’s run quite well over the years, but its original Anchoridge DS10 motor failed a couple of years ago, and was replaced with a Mashima motor with a London Road gearbox. It didn’t run particularly well, and was incredibly noisy, so I’ve now had another go at it, and this time have used a High Level Models ‘Roadrunner+’ gearbox with a Mashima 1020 motor. This was very easy to put together, and it only took me an afternoon to build the gearbox, dismantle the chassis and rebuild it with the new setup. It now runs sweetly, quietly and slowly - and I’ve ordered some more High Level gearboxes for a couple of other locos in need of a bit of TLC. The photos show the loco with its new gearbox and motor. The chassis is fully compensated, and built on the same principle as my other six-wheeled locos, for example ‘Strasbourg’, seen here. 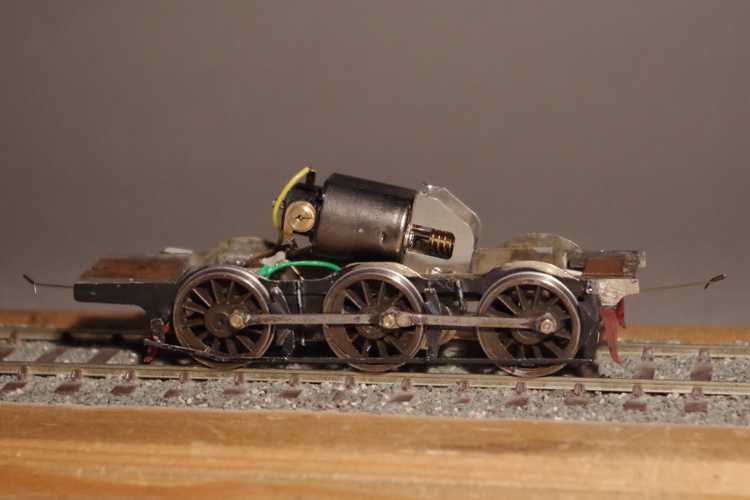 It’s not particularly obvious from the photos, but the gearbox is a two-stage box, with the second stage curled under the motor, and the final drive on the centre axle at a ratio of 54:1 - ideal for small tank locos.